Occasionally, I try an exercise: capturing the essence of composition in a few lines and colours. It’s a cognitive challenge. What am I seeing, what is important to show, what is best implied and not shown? Here are three drawings. The top is most recent, a line of pumpkins connect me to the scarecrow. This was done standing in the kitchen garden at Packwood House. These next two were done from the bike a couple of weeks ago. One looks across into a nearby field from over a gate and under hanging oak foliage, whereas the other is of hay bales in a more distant field, on the other side of the canal, leading back to a line of trees. A couple of weeks ago , we went to the Workers Gallery in Ynyshir to see Rose Davies’ exhibition, “The Hunt”. 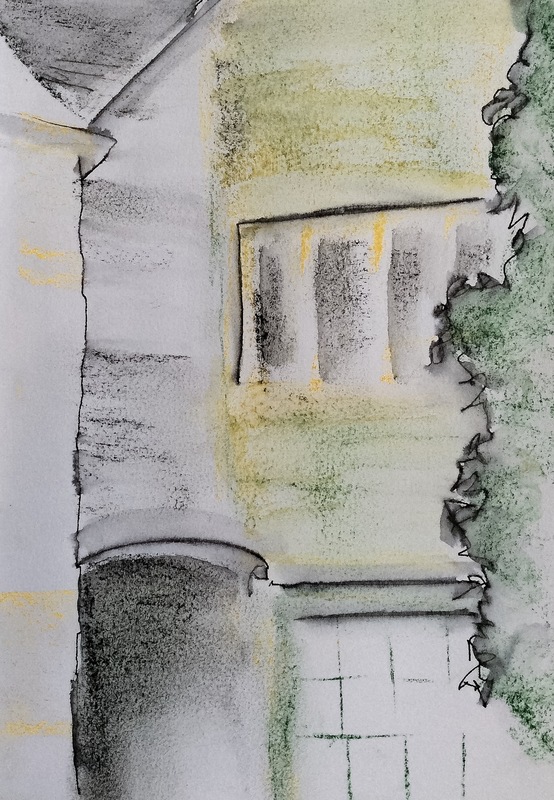 The next morning the family went for a long large breakfast while I took the chance to walk and draw. 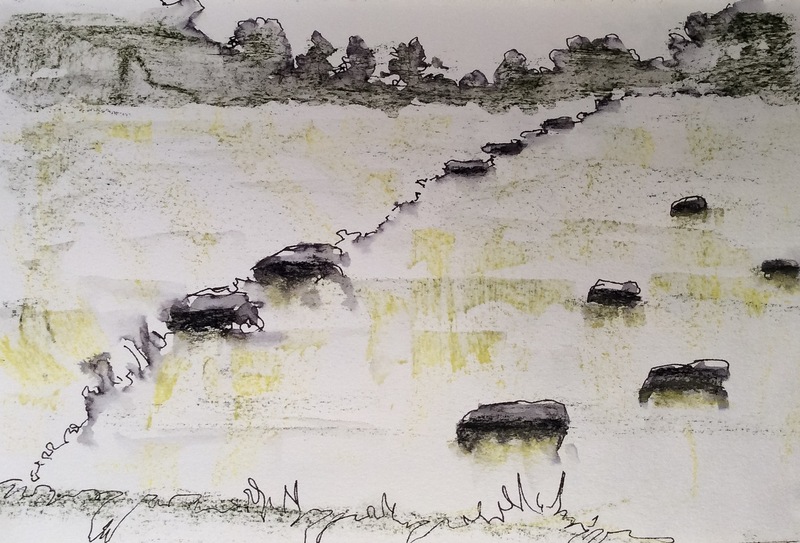 The marked path I took out of the Dare Valley park fizzled out into barbed wire and bracken so I never made it to the hill tops, but here are the sketches made on the way. A time lapse film over decades would show these wooded hillsides eroding and falling as the roots wrench apart the rocks, and their branches are pulled outward and down by wind, rain and gravity. On that one morning, I saw a single frame from this sequence, trees still gripping the ground, and growing first horizontal and then pulling themselves up to the vertical with a mighty effort. The film, speeded up, might show them balancing, teetering on the brink of ruin. The picture above shows the remains of a tree and the whitened skeleton of its major limb, ripped from the trunk. 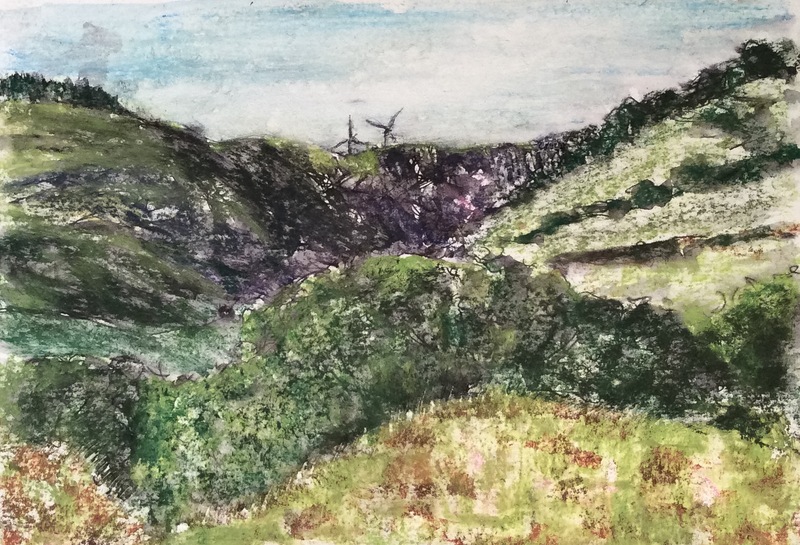 Below is the view across the valley to the wind turbines beyond. 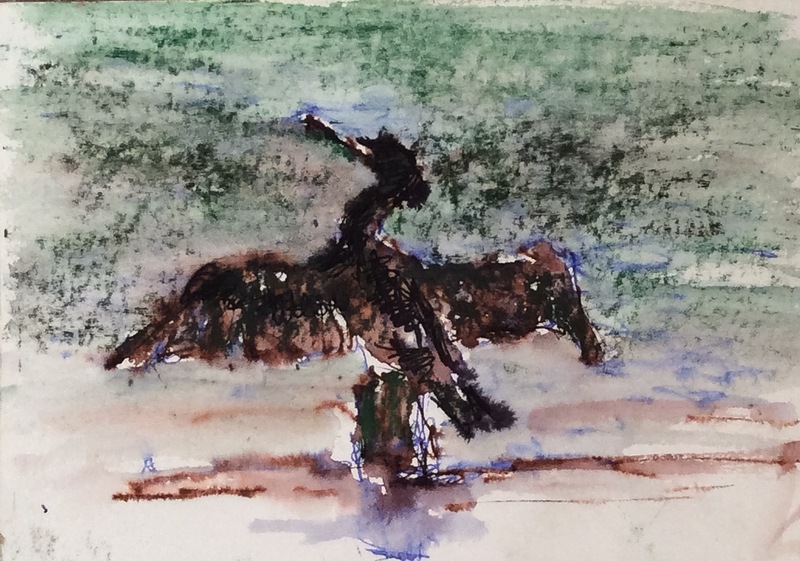 Both used the technique of fountain pen and water, then conte crayon textures built by drawing on the wet or dry surface. 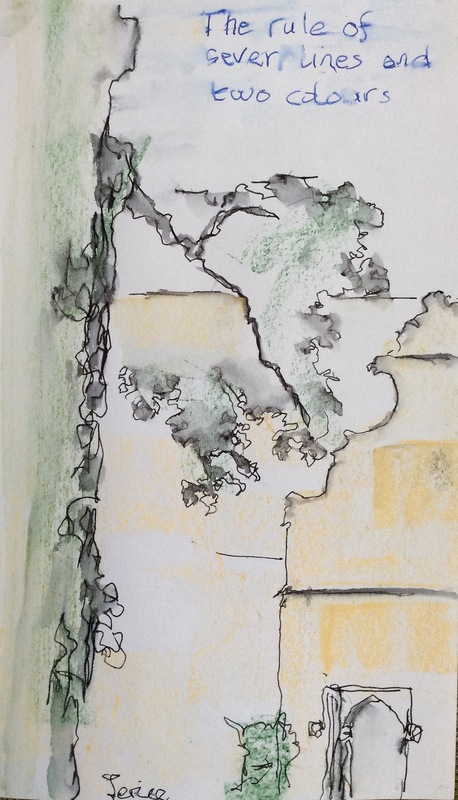 This was the first sketch that morning, at the pool on the valley floor, with a cormorant close by, drying its wings. 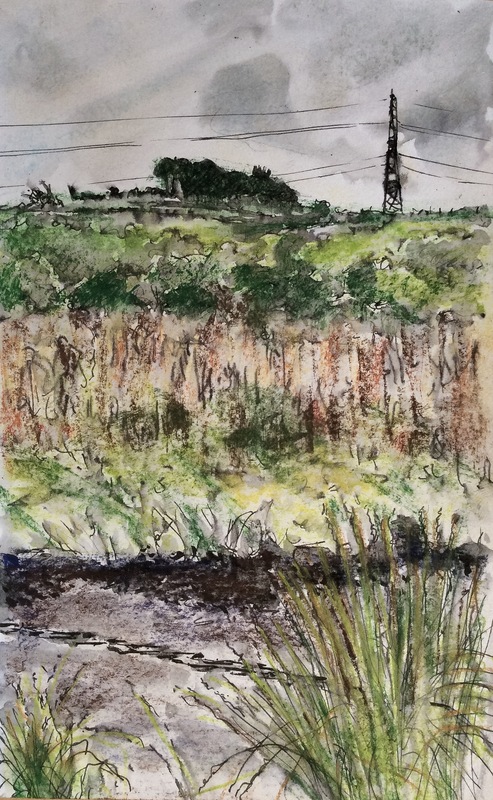 The sketch I wish I had done there would have shown the myriad webs spun between reeds and grass blades, catching the morning light, white against the golden glowing meadow. 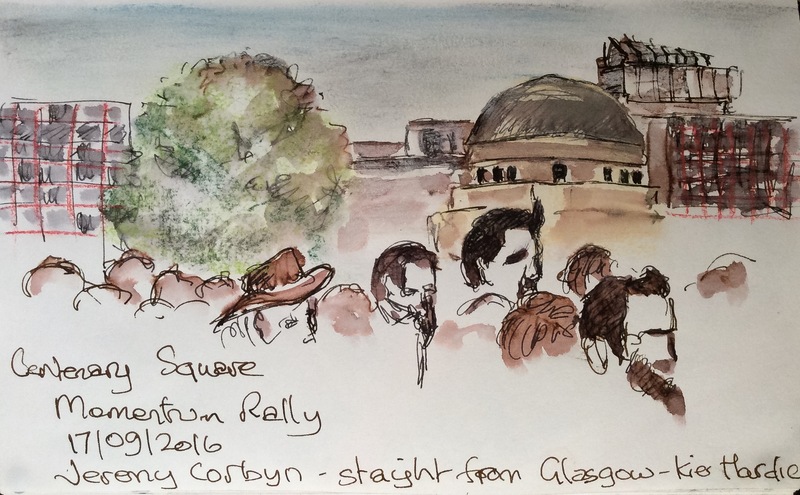 Last Saturday, I went to the Momentum rally. We were told Labour leader, Jeremy Corbyn, was coming straight from Glasgow, from speaking at the memorial for Keir Hardie, founder of the party and our first member of parliament 132 years ago. The square was filling up with the several thousand-strong crowd of supporters and interested passers by. 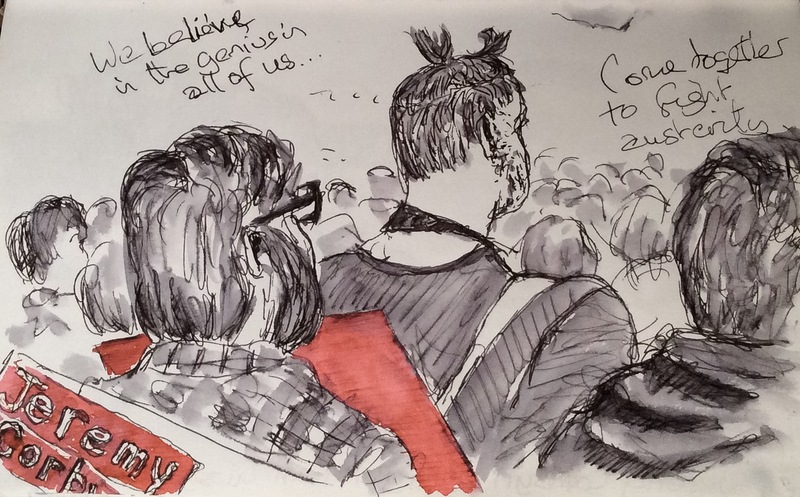 Too distant from the podium to capture the warm-up speakers, I seemed mostly to sketch the backs of people’s heads. 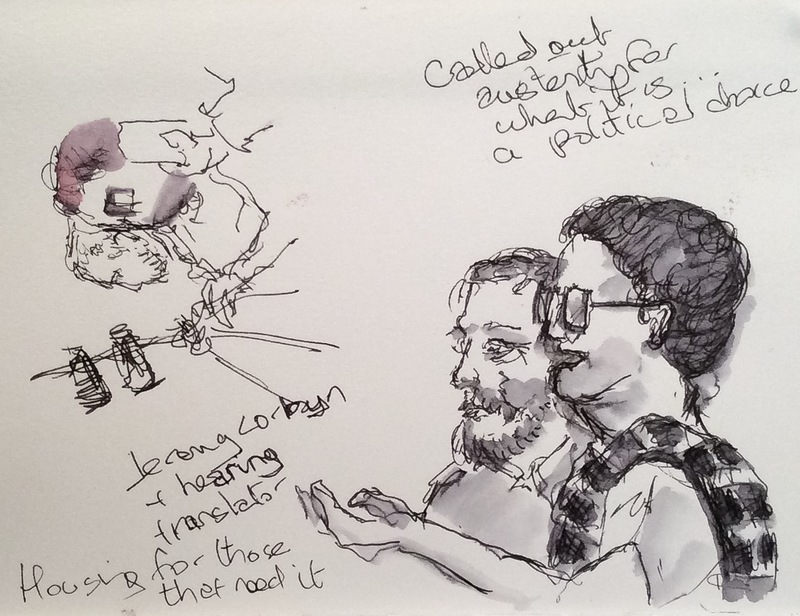 I moved round to the other side to try to get closer but now was blocked from the speakers by the deaf translator in a check dress, signalling animatedly and passionately. The organiser tried to whip up religious passion, wanting us to sing “Jez we can” to the non-tune of the crowds’ chant “here we go”. Diverse though the crowd was in many respects, in this they were English to the core. She failed utterly. 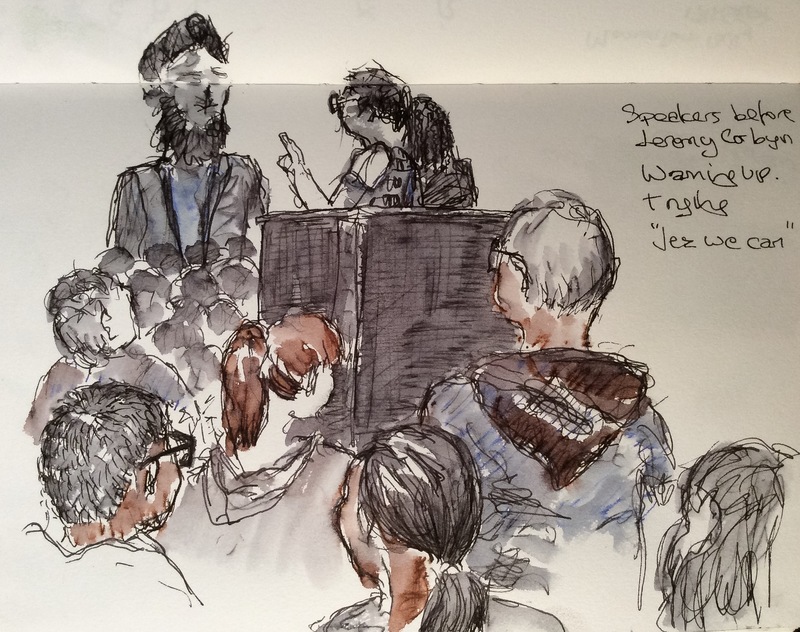 By contrast, my drawing lost all sense of proportion and the Sikh sound engineer appeared in my sketch to rise god-like from the masses. Jeremy had arrived and was eventually allowed to speak. His voice keeps the same pleasant pitch and randomly rises and falls in volume, without obvious connection to the points he is making. He is the anti-demagogue, the opposite of populist, using his non-eloquent skills to provide a masterclass in un-rhetoric. He whips the crowd into an intense absence of frenzy. What comes across is an honesty, humanity and approachability that has us cheering every point. 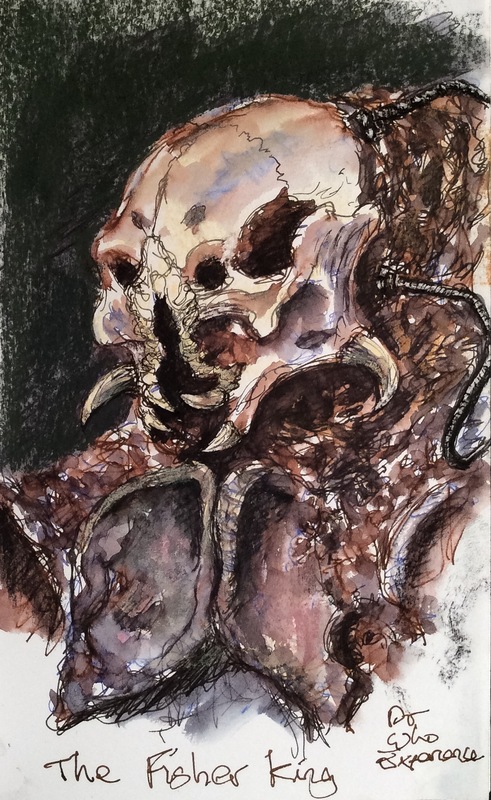 The Fisher King slaughters people to use as components in a psionic transmitter, intending to reach out to its compatriots adrift in the solar system. It is defeated by the Doctor through the use of a stasis chamber and a time paradox. This glorious costume prosthetic was created for the BBC by a guy called Dave Bonneywell. 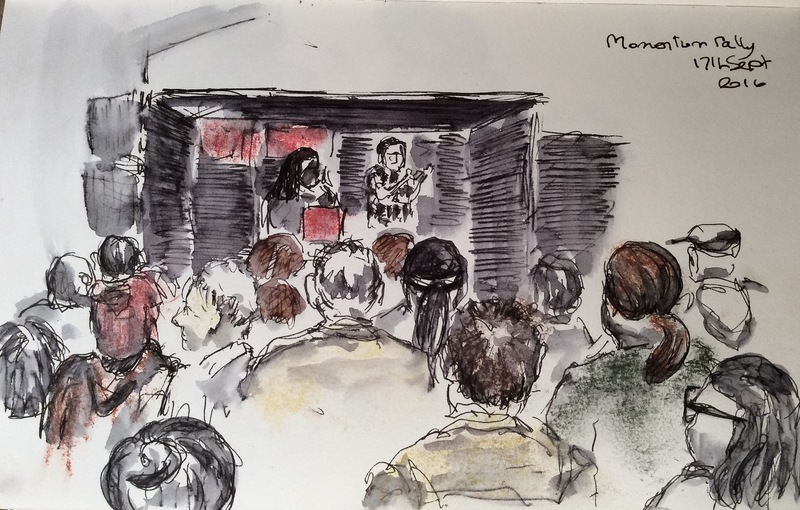 I drew it at the Doctor Who Experience in Cardiff, a museum and apocalyptic narrative which I highly recommend. This was one of the few places I felt at home with people coming up to me to watch me draw. 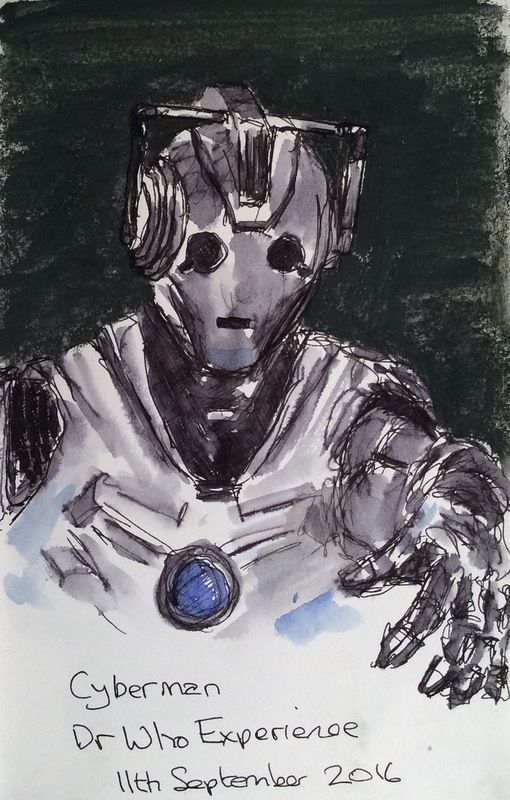 There too I sketched one of many iterations of cybermen, the arch-foe of my childhood. We had gone as a family to Wales to see the exhibition of paintings by Rose Davis called The Hunt. She joined archaeologist Dewi Bowen and film maker Melvyn Williams as they tracked ancient paths through the wilderness used by megafauna, stock and people, marked physically by megaliths and mythically through the rampages of the wild boar y Twrch Trwyth and his seven scions hunted by questing hero Culhwch, King Arthur and his knights. Over this year I have enjoyed the abstract representations of each standing stone as Rose posted these here on WordPress. I had heard the name “Fisher King” before but could not place it. A bit of research revealed the name to have been borrowed from a myth set which twists through time. In the Christianised version, the Fisher King is wounded in the lower body, perhaps crippled, perhaps emasculated, unable to rule but only to fish, but serves as the last guardian of the Grail which has healing powers. This story harks back to earlier narratives including that of the heroic English king Bran who owns a magic cauldron which restores slain warriors to battle fitness. In battle, he receives a mortal poisoned wound to his foot. On his instructions, his men take only his head (which continues to talk) back to the fortress of LLyr (Llyr’s dun) where it is buried on the White Hill by the Thames. From there he protects England until much later Arthur, in hubris, discards the head to his cost. This story comes from Welsh oral tradition, written down around the 12th century and later translated to English as the Mabinogion. This is the same body of myth from which comes the story of Culhwch’s labours to win the hand of Olwen, including hunt for the great boar, Twrch Trwyth. This is the last of my pictures from our week in Cornwall. Unfit and used to cycling the flattish West Midlands, I struggled, breathless and heart pounding, up the Cornish hills. 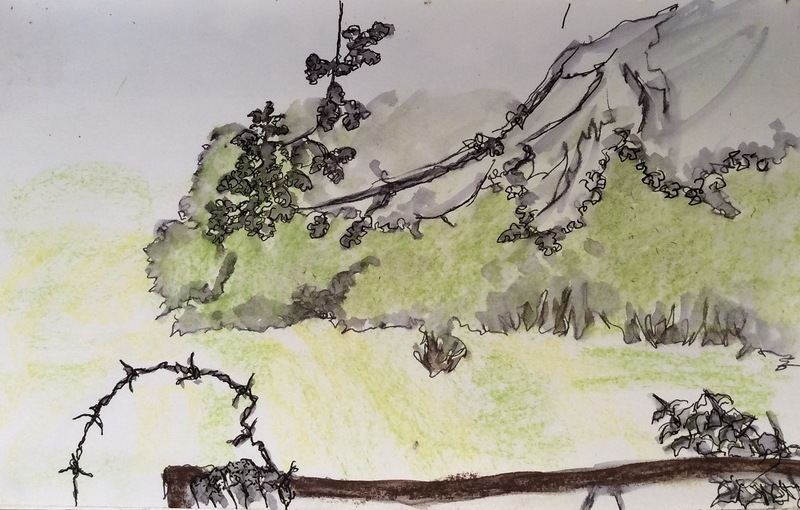 It was a relief to find a gap in the hedgerows, sunlight and a composition to draw. 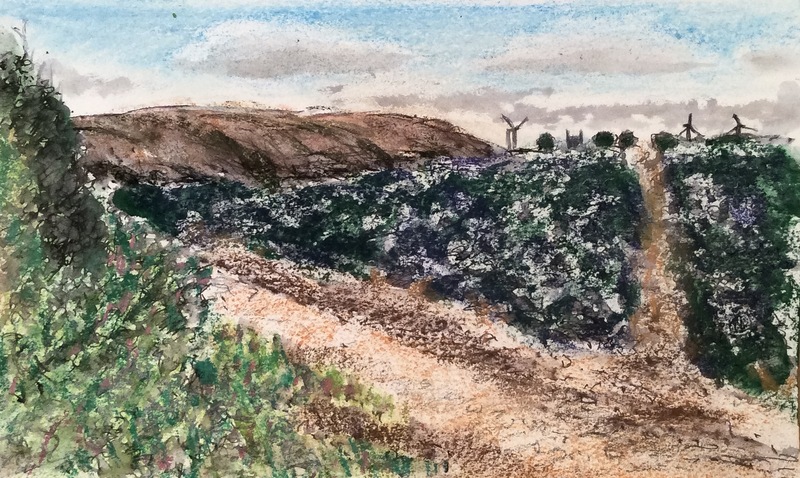 Here I looked across a large-leafed blue-green crop extending to the hill’s edge where I could see the blades of the distant wind turbines. As usual I started the composition in fountain pen. 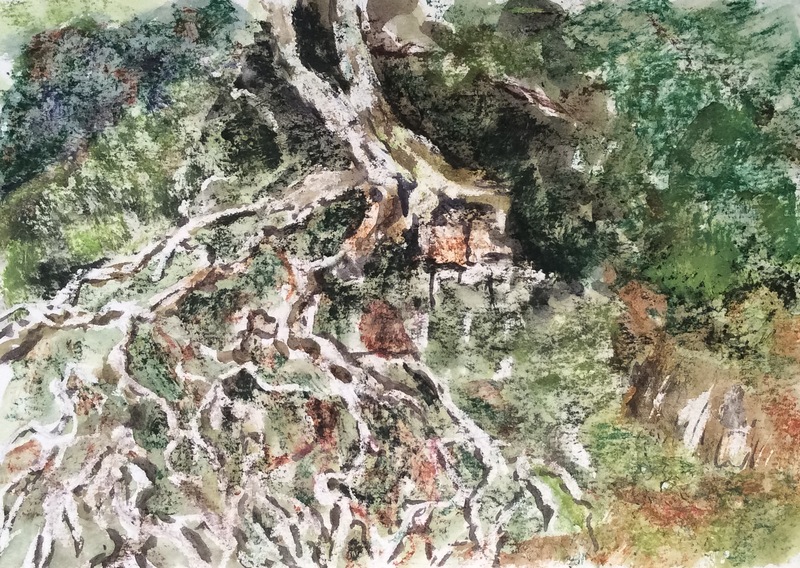 I worked conte crayon heavily into the wetted surface, aiming for a contrast against the lighter strokes catching the bite of the rough paper. The white crayoned clouds formed a resist which scattered the dilute ink used to shade their undersides. I lost the point of this drawing somewhere. 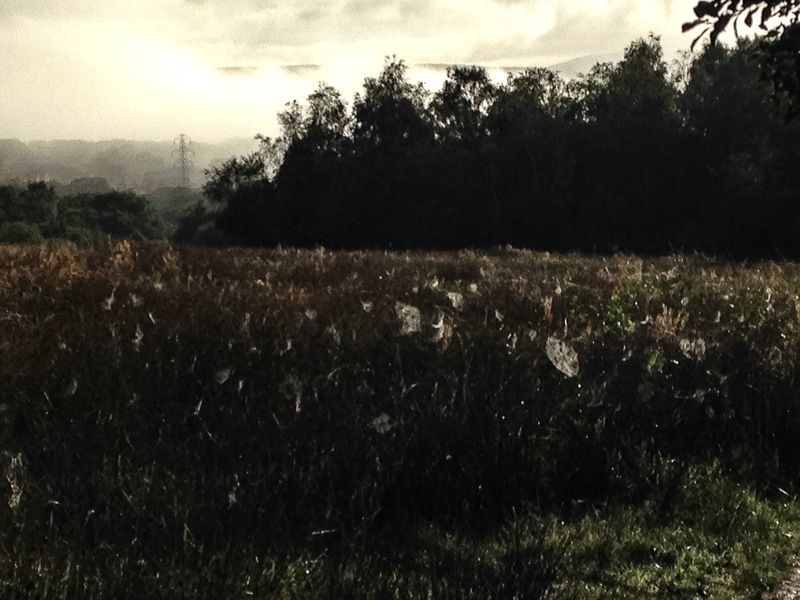 Goss Moor hosts a confluence of pylons and high voltage cables. The pond by the track held on its surface two almost perfect parallel lines, broken only by the slightest of ripples. 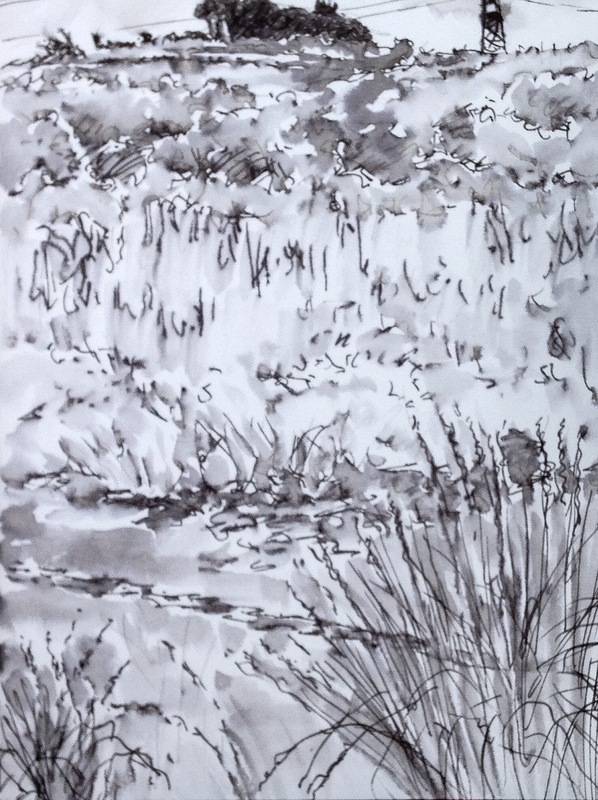 In my drawing, I have coarsened the water’s movements and successive corrections have blunted the starkness of the reflected wires against the reflected sky. As usual this was developed from my bike as a tone drawing in fountain pen and water. I wetted part of the surface when applying conte crayon, getting greater contrasts between solidly and lightly applied colour. I invented a rule to abstract from the subject . The rule limits any drawing to seven lines and two colours. I consciously cheated on my own rule in these two drawings at Trerice, an Elizabethan house in Cornwall. In the first, I followed the letter of the rule but not its spirit, drawing continuously to create more complex shapes and textures with a single so-called line. Ironically, I wrote the rule above in blue ink then spread this with water to provide a third colour. In the second, I used black crayon in addition to the permitted yellow and green, deciding black is not a colour.